This is used to ACTIVATE or REACTIVATE your StopSign membership. 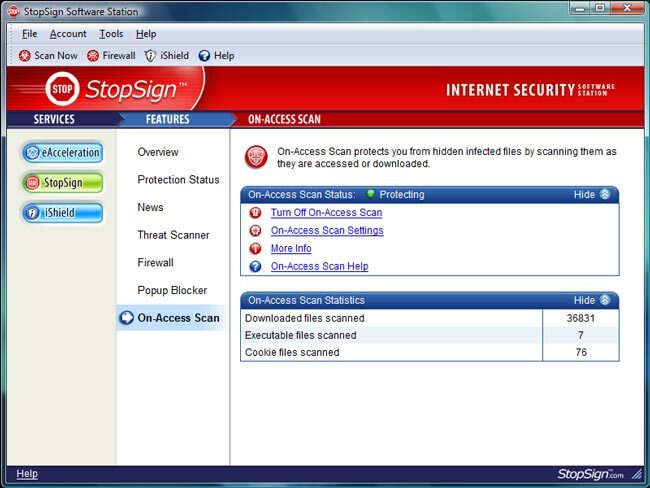 Though the StopSign Threat Scanner will automatically check for updates any time a scan us begun while users are connected to the internet, you may wish to force your scanner to update at another time. 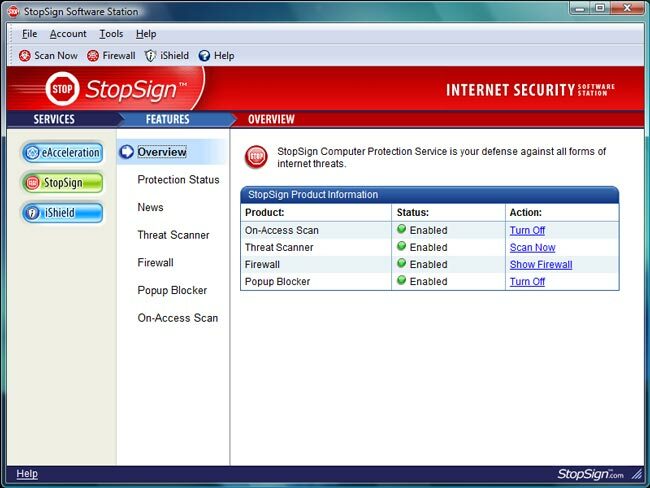 The Settings Dialog box allows you to make simple changes to the function of your StopSign software and the Software Station. Here you will find one click settings for how your software will receive updates - both checking for and installing these updates, as well as check box controls for the Software Station including showing a system tray icon for on your task bar, launching at computer startup and others. 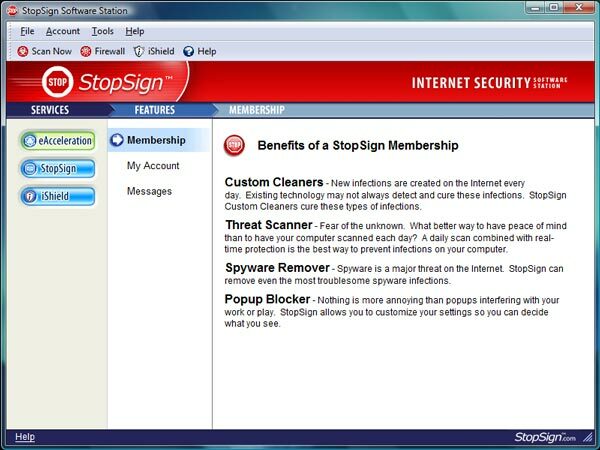 Membership Provides overview information regarding Custom Cures , the Threat Scanner, Spyware Remover and Popup Blocker. My Account Snapshot view of your account data including your Account ID, email address used when activating the account, and expirationtion date. 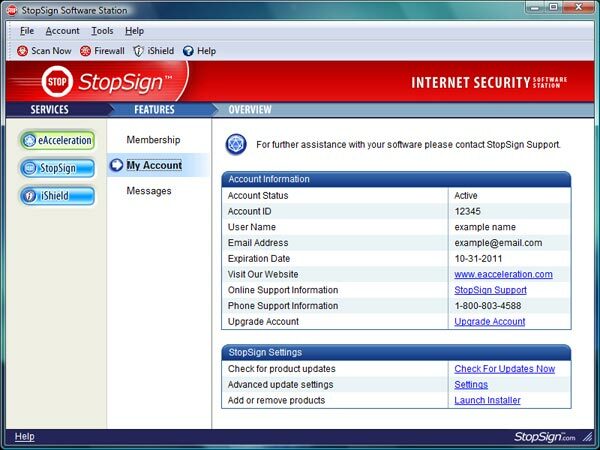 Also provides StopSign Support Team contact information. 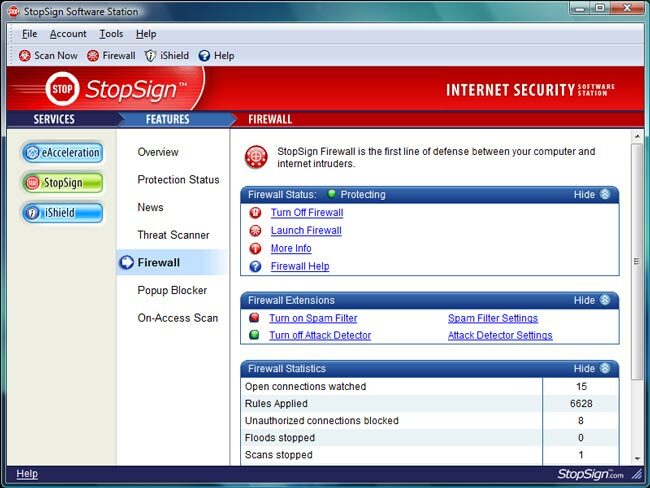 OVERVIEW A simple summary chart telling users if the StopSign products On Access Scan, Threat Scanner, Firewall and Popup Blocker have been enabled with quick links to turn these features on or off. 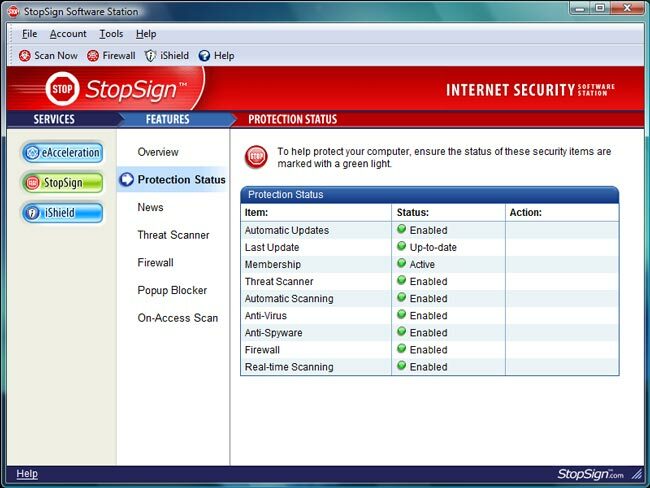 PROTECTION STATUS A summary chart with more details regarding specific StopSign features than the above referenced overview chart. This entry does not allow for changes to any settings, but does tell you the status of a (Enabled, Active or Up-to-date) of each product. 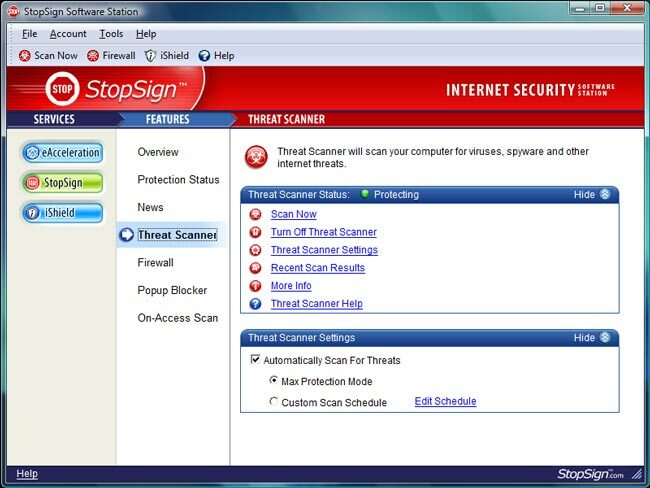 THREAT SCANNER Is a portal allowing users to make changes to their threat scanner settings, such as scheduling the scanner to run at a certain time. It can also be used to turn the Threat Scanner on or off or see the latest scan results. FIREWALL Is a portal to make changes to the Firewall or turn the Firewall off or on. 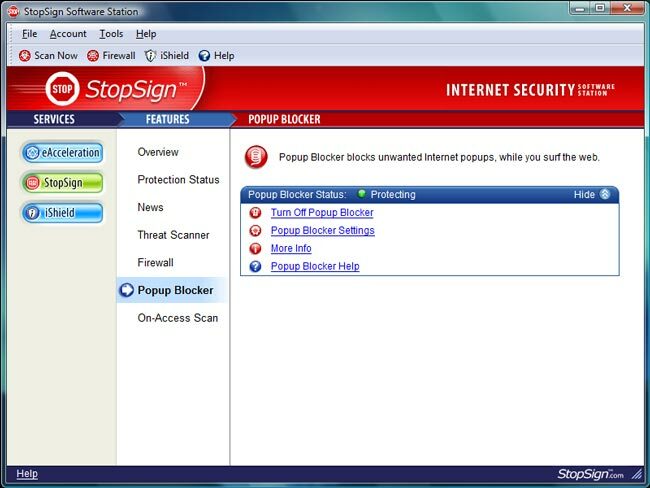 POPUP BLOCKER User can use this entry to turn the Popup Blocker on and off and can also customize their Popup Blocker settings if necessary. ON ACCESS SCAN Users can see if the On Access Scan has been enabled. Users can also make changes to the On Access Scan settings.